It’s been said that one could set their watch to the schedule of the UK National Rail system, as the system was nigh perfectly run. 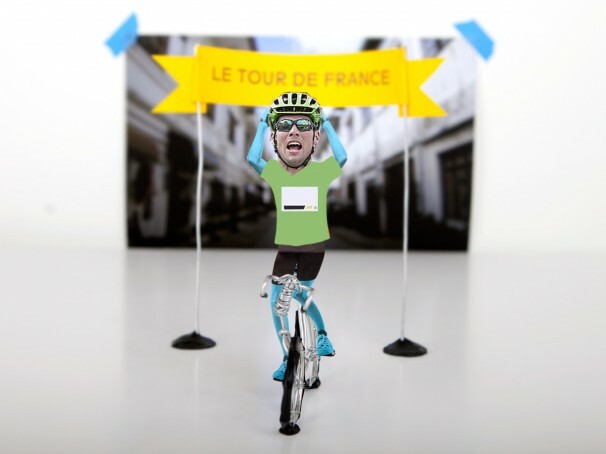 In recent iterations of the Tour de France, if the finish is a flat one, one could be fairly safe in selecting Mark “Honey Badger” Cavendish of Team HTC-High Road as the winner; his leadout train was that good. Very rarely is the man spoiled in his quest to rack up sprint stage wins. Much like his spirit animal, Cavendish rips his opponents to shreds, disembowels them, and eats their entrails as any true hard cyclist must. What? You don’t do that? No wonder you’re still a Cat. 4. Today was no exception to the Cavendish killing-spree. All the bettors in Belgium who played it safe and went with Cavendish in lieu of Tyler Farrar of Garmin-Cervelo must now be celebrating by downing shot glasses of mayonnaise and drinking some stinky abbey ale. Or at least that’s what we imagine they’re doing. Isn’t that what real cycling fans do? Stage 15 was a mixed-bag of a course, a 192.5km jaunt from Limoux to Montpellier. All the usual animators created some hot action — Phillipe Gilbert of Omega Pharma-Lotto tried to break free in the last few kilometers, maybe to pay tribute to his bleached blonde hair. He was reeled back in by Cavendish’s train of young lads, who delivered the hot, sweaty Manxman to the line seamlessly. Also not surprisingly, our favorite Frenchman with a weird tongue, Thomas Voeckler of Europcar is still in yellow. Lance Armstrong thinks he can bring it on home, provided the climber GC types continue their streak of mediocrity.